see under PEACH SHORTCAKE Many people prefer this dainty to strawberry shortcake. 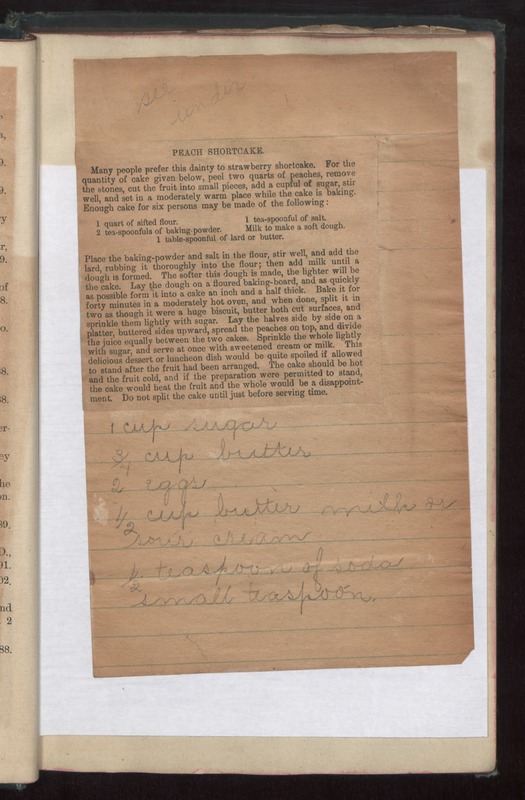 For the quantity of cake given below, peel two quarts of peaches, remove the stones, cut the fruit into small pieces, add a cupful of sugar, stir well, and set in a moderately warm place while the cake is baking. Enough cake for six persons may be made of the following: 1 quart of sifted flour. 1 tea-spoonful of salt. 2 tea-spoonfuls of baking-powder Milk to make a soft dough. 1 table-spoonful of lard or butter. Place the baking-powder and salt in the flour, stir well, and add the lard, rubbing it thoroughly into the flour; then add milk until a dough is formed. The softer this dough is made, the lighter will be the cake. Lay the dough on a floured baking-board, and as quickly as possible form it into a cake an inch and a half thick. Bake it for forty minutes in a moderately hot oven, and when done, split it in two as though it were a huge biscuit, butter both cut surfaces, and sprinkle them lightly with sugar. Lay the halves side by side on a platter, buttered sides upward, spread the peaches on top, and divide the juice equally between the two cakes. Sprinkle the whole lightly with sugar, and serve at once with sweetened cream or milk. This delicious dessert or luncheon dish would be quite spoiled if allowed to stand after the fruit had been arranged. The cake should be hot and the fruit cold, and if the preparation were permitted to stand, the cake would heat the fruit and the whole would be a disappointment. Do not split the cake until just before serving time. 1 cup sugar 3/4 cup butter 2 eggs 1/2 cup butter milk or sour cream 1/2 teaspoon of soda small teaspoon.